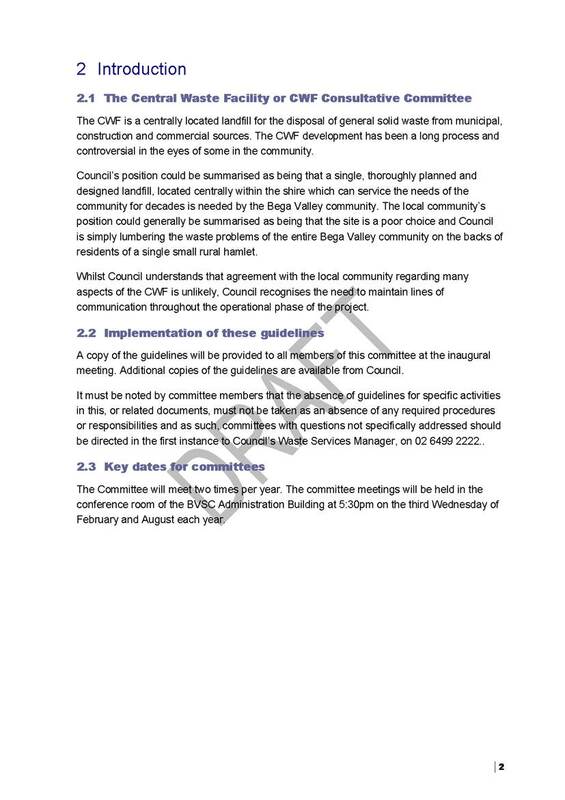 An Ordinary Meeting of the Bega Valley Shire Council will be held at Council Chambers, Bega on Wednesday, 22 January 2014 commencing at 2.00 pm to consider and resolve on the matters set out in the attached Agenda. That the Minutes of the Ordinary Meeting held on 18 December 2013 and the Extraordinary Meeting held on 18 December 2013 as circulated, be taken as read and confirmed. 12.8 Certificate of Investments made under Section 625 of the Local Government Act 1993.................................................................... 64 . In accordance with the Council resolution of 27 November 2013 a further report regarding the proposed amendment to the zoning plan for Kalaru Racecourse is presented for Council’s consideration. 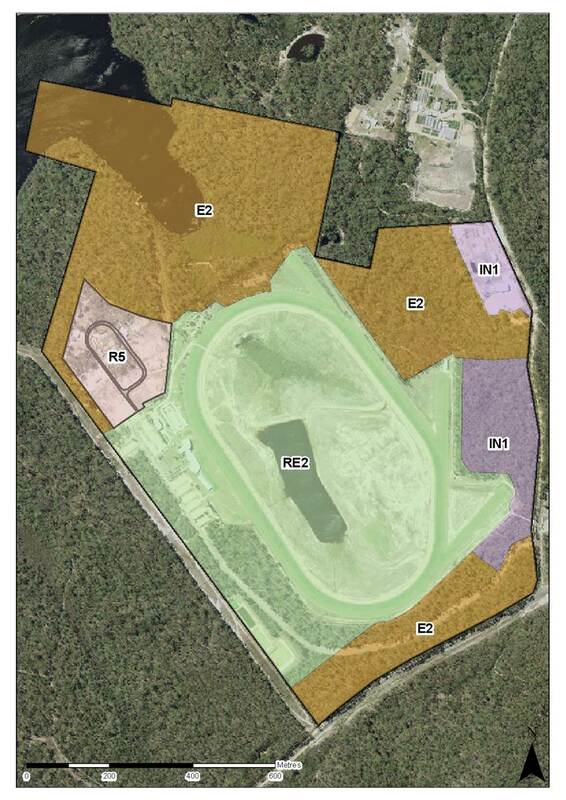 Council at its meeting on 27 November 2013 gave consideration to a staff report on the proposed amendment to the zoning plan for Kalaru racecourse and following an address to Council, resolved to defer the matter for a further report. Ms Robyn Bain addressed the Council meeting on behalf of Sapphire Coast Turf Club and outlined the Strategic Plan for the future development of the Turf Club land. 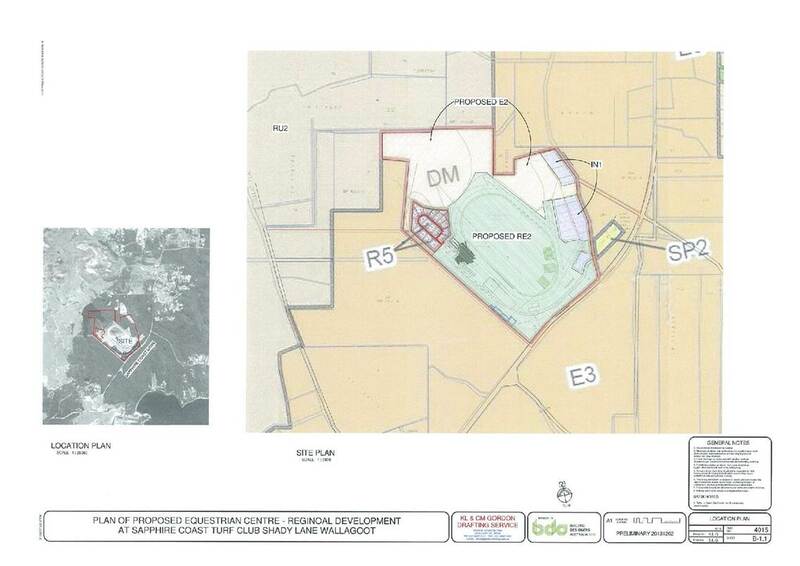 Whilst the Club supports the majority of the proposed zoning for the racecourse land, the Club objects to the proposed E2 Environmental Conservation zoning of that part of the land located between Shady Lane and Sapphire Coast Drive. The Club considers an E2 Environmental Conservation zone would sterilise the land and restrict the future expansion of the Turf Club and has requested the land be zoned RE2 Private Recreation. 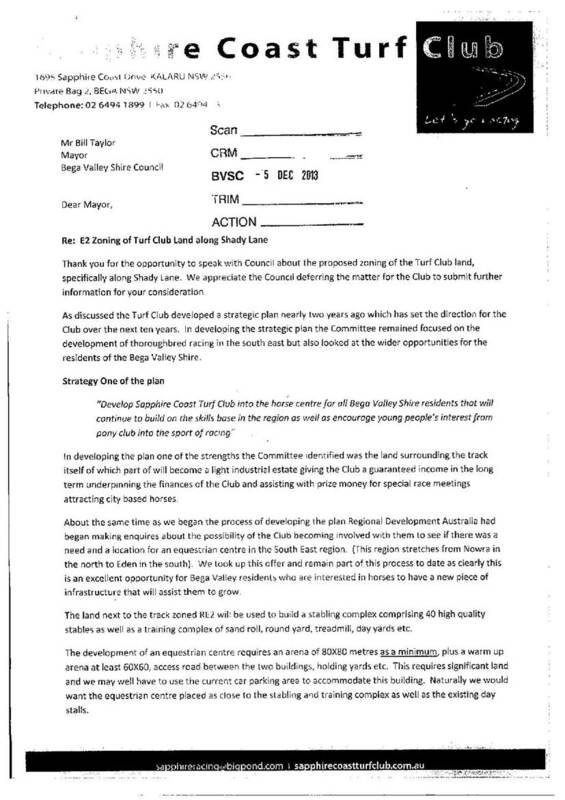 Following the Council meeting on 27 November 2013, the Sapphire Coast Turf Club provided additional information to support their request for the land located along Shady Lane to be zoned RE2 Private Recreation instead of E2 Environmental Conservation as recommended by staff. A copy of this additional information including plans, are provided in Attachments 1 and 2 of this report. Strategy one of the Sapphire Coast Turf Club Strategic Plan 2012-2022 is to “Develop Sapphire Coast Turf Club into the horse centre for all Bega Valley Shire residents that will continue to build on the skills base in the region as well as encourage young people’s interest from pony club into the sport of racing”. The additional information states that to achieve this objective the Turf Club are involved with Regional Development Australia to try and secure a new regional equestrian facility on the Turf Club’s land. In the event that the Turf Club is successful, the land along Shady Lane may be required for car parking for race days and other horse events. Zoning the land along Shady Lane E2 Environmental Conservation will diminish the strength of the Club’s proposal by removing available land. 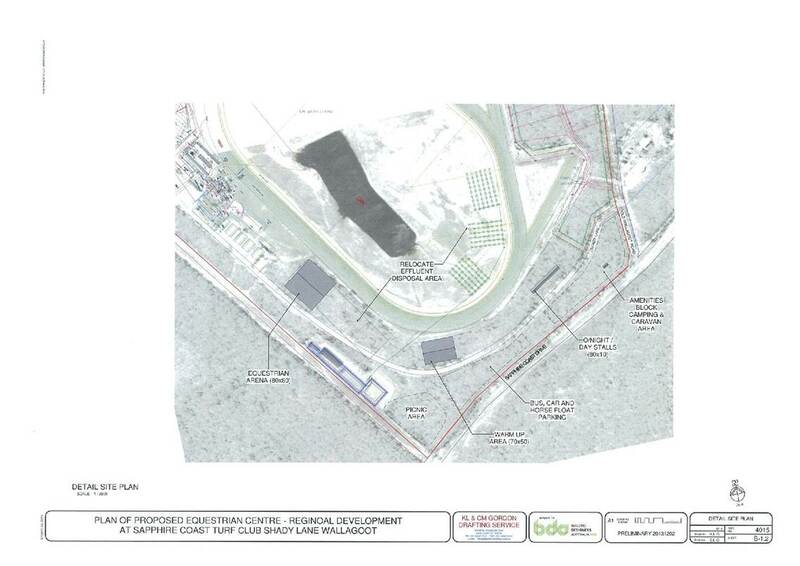 As previously reported to Council on 27 November 2013, the Office of Environment and Heritage has requested that all the land outside the existing racecourse facilities and the approved industrial subdivision be zoned E2 Environmental Conservation. 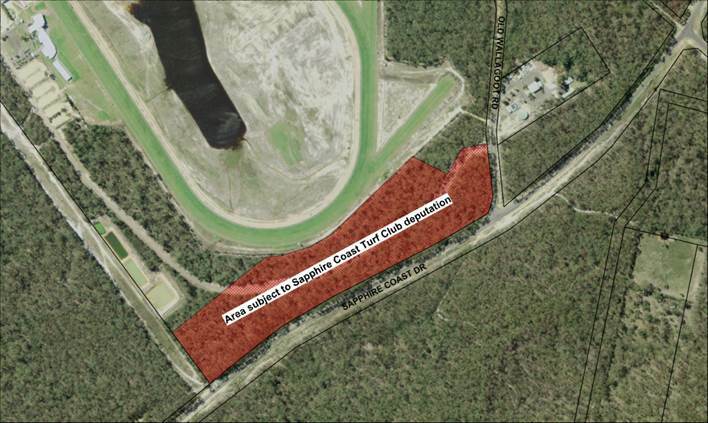 The Sapphire Coast Turf Club has agreed to the land on the north-western part of the property that comprises Penuca Swamp and between the race track and the approved industrial subdivision being rezoned E2 Environmental Conservation. However the Club does not agree with the proposed E2 zoning for that land comprising a 100m strip between Shady Lane and Sapphire Coast Drive. Council staff consider that the land located to the south east of the existing race track, described in this report along Shady Lane and identified in Figure 1, should be zoned E2 Environmental Conservation to ensure that the existing native vegetation is retained to ensure east – west connectivity. Council staff have reviewed the information submitted by the Sapphire Coast Turf Club including their Strategic Plan 2012-2022 and details of the address to Council. Council staff maintain the view that the environmental values of the Turf Club land adjoining Shady Lane warrant the protection of the E2 Environmental Conservation Zone. This is consistent with the recommendation of the Office of Environment and Heritage. It is recommended that Council resolve to amend the Kalaru Racecourse Planning Proposal in accordance with the plan in Attachment 3 and forward the revised planning proposal to the Minister for Planning for reconsideration through the gateway determination in accordance with Section 58 of the EP&A Act. This report recommends the revocation of the Dangerous Dog Declaration of a dog owned by Mr Stefan Verbancic. Following a complaint about a dog attack in Wallagoot and subsequent investigations by Council’s Rangers, Mr Stefan Verbancic’s dog “Pete”, microchip no. 982009102286134, was declared dangerous under Section 34 of the Companion Animals Act 1998 in October 2006. As required by the legislation, the Director General of the Division of Local Government was advised of this Declaration. This Dangerous Dog Declaration has remained in force since that time. The dog’s owner has recently formally sought a revocation of the Dangerous Dog Declaration. This request is supported with two letters from associates of Mr Verbancic which state that “Pete” is a friendly dog which has shown no aggression. Mr Verbancic states that his dog has aged rapidly due to tick bites, arthritis and a snake bite. The most recent inspection of the dog and enclosure was carried out on 9 September 2013. The ranger performing the inspection found the dog approachable and not aggressive. The victim who was seriously injured in the attack in 2006 has since moved from the area. Mr Verbancic was fined in March 2007 for the dog being uncontrolled in a public place, but has otherwise been compliant with the requirements of the Declaration. Council’s rangers are supportive of the revocation of the Dangerous Dog Declaration on “Pete”. Under Section 39 of the Companion Animals Act 1998, only Council itself can revoke a Dangerous Dog Declaration. Staff support the revocation of the declaration owing to the circumstances described above. Should Council resolve to revoke the order, Council is required to notify the Director General of the Division of Local Government of the decision. This application by Mr Stephan Verbancic for the revocation of the Dangerous Dog Declaration of his dog ‘Pete’ is supported by ranger staff. Veterinarian advice has been supplied by the applicant in support of the application. That the Dangerous Dog Declaration applying to Mr Stefan Verbancic’s dog “Pete” (microchip no. 982009102286134) be revoked pursuant to Section 39 of the Companion Animals Act 1998, and that the Director General Division of Local Government and Mr Verbancic be advised of Council’s decision. Stockyards were built and later determined to be encroaching onto a Council public road at Buckajo. Council approval is being sought to amend the alignment of a section of the unformed road, in order to rectify the encroachment whilst maintaining access to adjoining landowners. Stockyards have been constructed by the owner of Lot 167 DP 750216 at Buckajo, Mrs Norma Sirl, within the last five years. As a result of a development application lodged by adjacent landowners seeking a subdivision, a survey was conducted in line with Council requirements and the survey revealed that the stockyards encroached onto the Council public road reserve. 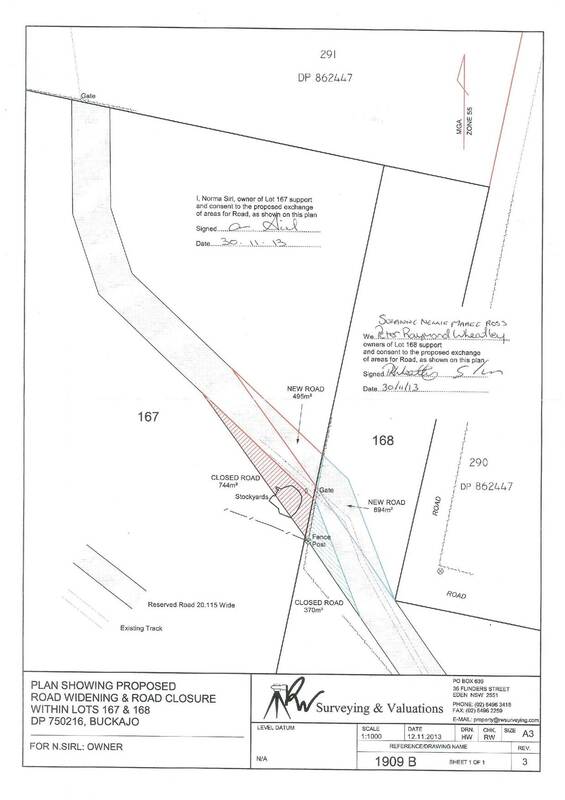 The road provides legal access to numerous other properties, however the owners of the adjacent Lot 168 DP 750216, are the only neighbours directly affected by the proposal to realign the road. They have however provided their consent to the course of action proposed. Council staff have held discussions with the property owners and their appointed surveyors, RW Surveying, in order to rectify the encroachment whilst maintaining public road access. It is considered that an amendment to the alignment of the road is the most cost effective option. The adjoining owners of Lot 168 DP 750216 have agreed to the proposed plan of road widening and road closure as per the attached plan. The sections of road to be closed will be transferred to the owners of Lots 167 and 168 in exchange for the sections of road to be widened and dedicated to Council. If Council give consent to the proposal as outlined, a road closure application will be prepared by Council on behalf of the owner of Lot 167 and lodged with Crown Lands for processing. If approved by Crown Lands, a plan will be finalised by the surveyor, submitted to Council and subsequently registered with Land and Property Information (LPI). Due to the financial costs involved to remove and relocate the stockyards, it is considered that the preferred option is a minor realignment of the unformed road. The proposed actions will be at the sole cost of the owner of Lot 167 DP 750216 and at no cost to Council. Council staff time will be expended throughout the process. The course of action as proposed is to the benefit of the owner of Lot 167 DP 750216, Mrs Norma Sirl and will satisfy her legal obligations by rectifying the encroachment onto the Council road reserve. 1. That Council note the report and approve the agreed course of action to rectify the encroachment and maintain public road access, to be undertaken by the landowners of Lot 167 DP 750216 at no cost to Council. 2. That Council consents to the lodgement of a road widening and road closure application within Lots 167 and 168 DP 750216 at Buckajo. 3. That the Mayor and/or the General Manager be authorised to execute the necessary documents as may be required. This report details the 2013/14 Better Boating Program Grant and Funding Agreement for the Wonboyn Lake Boat Ramp and Jetty Upgrade. The Better Boating Program (BBP) is a State Government grants program, aimed at providing waterways infrastructure for the benefit of the boating community and the marine sector on NSW waterways. The BVSC Maritime Infrastructure Plan, which is a subordinate plan to the Recreation Asset Management Plan (RAMP), assessed the condition, capacity and functionality of Council’s existing maritime infrastructure, against current and projected requirements. The plan identified Wonboyn Lake boat ramp and jetty as a high priority for upgrade and was the subject of Council’s 2013/14 BBP Grant Application. This application was successful and Roads and Maritime Services (RMS) has provided Council with a Letter of Offer for a grant of $245,000, being 50% of the total estimated cost of the project. Council was required to enter into a Formal Agreement with RMS, in accordance with the BBP Conditions of Grant and the Letter of Offer by 20 January 2014. A Review of Environmental Factors will be completed and a permit obtained from NSW Industry and Investment (Fisheries) for the project. The Wonboyn Lake boat ramp and jetty are Council assets, located on a Council managed Crown Reserve. The project is identified as a high priority project, within the RAMP and the subordinate Maritime Infrastructure Plan. Preparation of the Maritime Infrastructure Plan involved extensive stakeholder consultation during 2013. The project budget is $490,000 and the Grant Offer of $245,000 is based on 50:50 co-contribution. Matching funding has been programmed in Council’s Delivery and Operation Plan 2013/14. The project will be managed by the Project Engineer who successfully delivered the Merimbula Public Jetty and Merimbula Boat Ramp and Finger Pontoon BBP projects. The BBP Grant Offer provides a valuable opportunity to significantly upgrade the Wonboyn Lake Boat Ramp and Jetty, which is a high priority project within Council’s RAMP. 1. That Council note and endorse the acceptance of the Funding Offer and execution of the Funding Agreement by the General Manager. 2. That the project proceed in accordance with the BBP Conditions of Grant. A further report on the outcome of the nomination process for community membership of the CWF consultative committee and committee guidelines. 1. That Council re-endorse the formation and composition of the Central Waste Facility Consultative Committee for a 2 year period with a review of the Committee to be conducted prior to the end of the 2 years. 3. 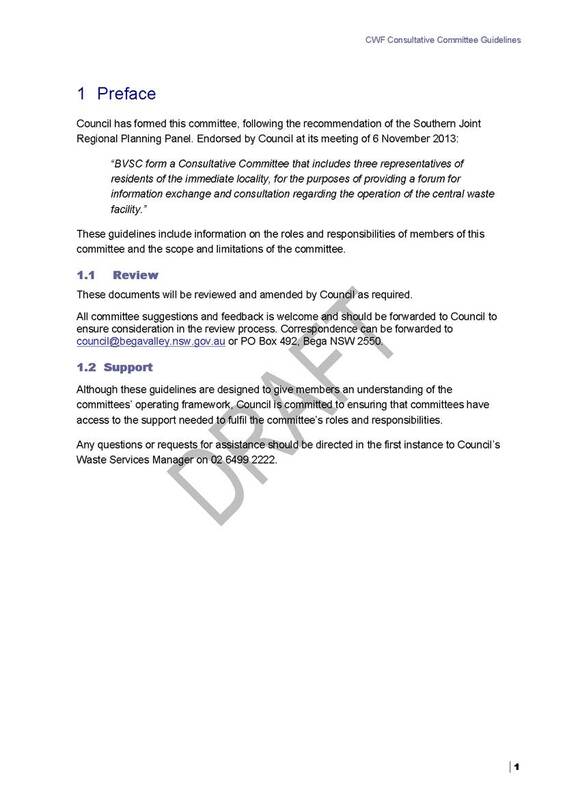 That Council consider the final terms of reference for the Central Waste Facility Consultative Committee at the meeting at which it considers the appointment of members to the Committee. Council has advertised for nominations for a CWF consultative committee on two occasions. On the first occasion in April 2012 no nominations were received. On this occasion, two nominations have been received. In order to fulfil the intent of the JRPP recommendation, albeit with fewer community representatives, this report recommends Council proceed with formation of the committee and provides some proposed committee processes and guidelines for consideration. It is not proposed that the committee be delegated power to exercise functions on Council’s behalf. The purpose of the committee is consultative and is not a committee of Council within the meaning of Section 355 of the Local Government Act 1993. The chair of the committee may refer outcomes of committee meetings to Council or staff for consideration and execution, in accordance with the organisational delegations already endorsed by Council. The formation of a CWF consultative committee has potential strategic benefit with regard to providing an established forum for discussion regarding ongoing management of the CWF. The formation of a CWF consultative committee would generally accord with Council’s objectives articulated in the communications strategy. There are no costs associated with the formation and operation of the CWF consultative committee other than staff costs. Any extraneous costs will be met from the CWF budget. The CWF consultative committee will consist of the Waste Services Manager as chairperson, the Mayor or an elected delegate of the Council and two local residents. Little apparent community interest has been shown in the formation of a CWF consultative committee. Council should however proceed with establishment of the committee, as it provides a structured forum for consultation with the community regarding the future operation of the CWF. 1. 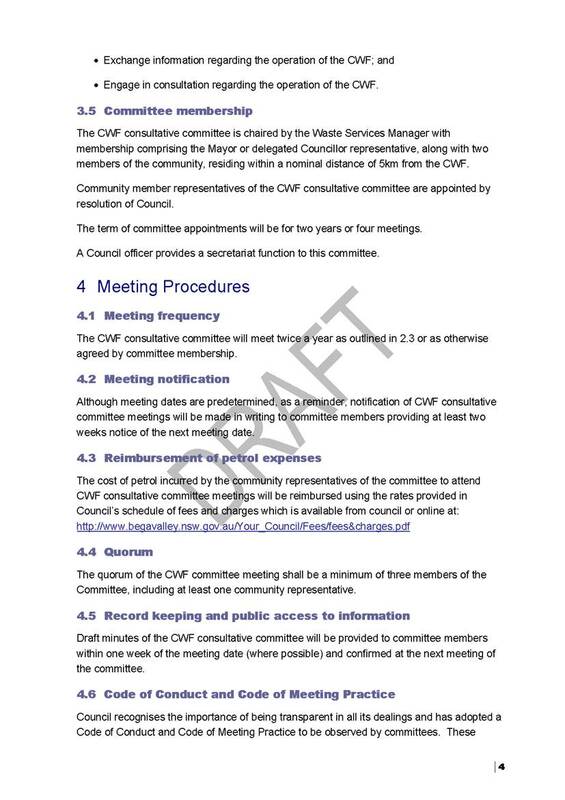 Council endorse the draft guidelines for the operation of the CWF consultative committee. 2. Council accept the two community nominations for membership of the CWF consultative committee and write to the nominees accordingly. Council annually receives many requests for un-programmed financial assistance. This process needs to be more formally managed to ensure all such applications can be assessed appropriately and due diligence to the allocation process is applied. Council has a number of funding programs that provide opportunity for community groups and others to access support to assist them provide programs, activities, infrastructure for the local community. There are a number of formal programs where Council formally calls for applications against a particular set of criteria and the applications are assessed by staff, reported to Council for formal resolution. These include senior’s week grants, youth week grants, and environment program grants. Council also has a “Requests for Financial Assistance (donation)” procedure. This has been used to assist groups when Council receives requests for financial assistance, refunds, rebates or works in kind, that do not fall within the criteria or timeframe of its programmed financial assistance or grants. Where appropriate and within budget limitations Council may make financial assistance available. Under Section 356 of the Local Government Act (1993), Councils can contribute money to groups or individuals for the purpose of ‘exercising its functions’. This term is open to interpretation and provides scope for Council to support a range of sponsorship, donation or works scenarios. Council is now in a position where it is receiving an increased number of applications under this procedure and decision making is therefore ad hoc with no opportunity for assessing the relevant importance or relevance of each request. So if a critical and important project surfaces late in the financial year when funds have been allocated it may fail to be supported with the losers being the community. Council does however realise that opportunities arise with short timeframes that make it difficult to address these requests in an annual assessment process. Some organisations will address requests to Council for consideration in Council’s annual budget process and this allows careful consideration of the merit of the proposal and appropriate allocation of funds in the Council’s draft budget. In order to develop a flexible but structured assessment process it is recommended that Council alter its procedure and put in place a new model for the 2014/15 year. This would also include requests for “in kind works or services” as this also places pressures on Council’s annual budget. 1. An annual call for projects to be considered and where appropriate included in Council’s budget discussions. This would involve a call for applications for direct financial assistance or in kind works or services in February of each year. Applicants would be required to complete an application form and submit this by the end of March. These requests would be assessed by relevant Council staff and presented to Council for consideration and inclusion in the draft budget. 2. Two other assessments of funding consideration would be held annually to consider one off projects that may arise and report to Council for consideration. A copy of the current procedure is attached with tracked changes proposed. Under Section 356 of the Local Government Act 1993 Council can contribute funds to groups or individuals for the exercising of its functions. This proposed changes to this procedure places an improved strategic framework to the manner in which Council manages this area of its operation. Application forms for each stream of potential funding will be available on the Council’s website as e-forms. This procedure assists enact Council’s requests for assistance policy. If Council resolve to adopt the proposed changes to the procedure then the new procedure will be widely advertised and key groups advised. Council would immediately call for applications for assessment for the 2014/15 budget process and widely advertise this. The budget allocation for this area is $230,000. Currently $165,000 has been allocated for the 2014 year. Regular allocations for school end of year awards of $100 per school, generic advertising, and reimbursement of DA fees as outlined in the relevant policy, and waiving for burial and cemetery fees, waiver of tipping fees for charities and reimbursement to hall and sportsground fee committees are also covered from this area. Town teams also use this allocation number for commitment of time and plant for community events they support. The introduction of this revised procedure and a potential reporting improvement in Council’s financial system will allow more formal reporting of allocations under each category. If the revised procedure is adopted the allocation of funding will be able to be brought in line with the annual budget preparation. The new procedure will also meet the current reporting requirement of the procedure which has not always been met. The current procedure for assessing requests for financial assistance required review to streamline processes, allow for proper consideration of requests on merit, ensure probity in terms of reporting and reduce administrative work. The new procedure will ensure a strategic consideration of the allocation of funds to major events and activities which has been ad hoc. It is also proposed that Council receive an annual report on the allocation of support provided through this area and that this be published as Council provides considerable direct and in kind support to the community which is generally not recognised. Recipients will also be required to advise how they will appropriately acknowledge the Council support. 1. That Council adopt the revised requests for financial assistance (donation) procedure. 2. That Council advertise the first call for applications for the 2014/15 year immediately and widely circulate information about the change procedure. Twyford Hall Committee has requested assistance to fund archaeological investigations required as a condition of DA 2007.0144. Twyford Hall Inc has requested Council assistance towards the cost of a mandatory Archaeological Investigation for Aboriginal heritage required as part of the conditions of DA 2007.0144 - alterations and additions to Twyford Hall. The investigations are necessary prior to issuing of a construction certificate. The Twyford Hall Complex has been managed by a committee of Council since 1980. 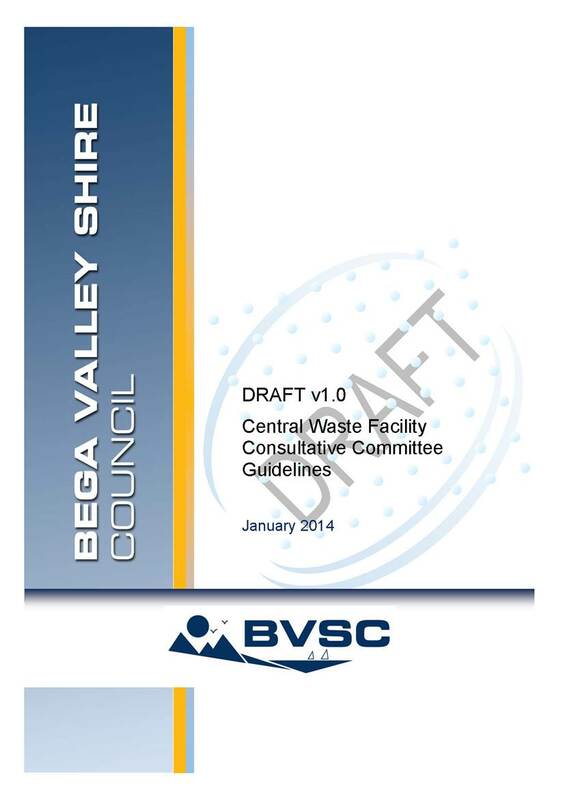 The Committee has entered into a Management Services Agreement with Bega Valley Shire Council. The Committee have been very proactive in developing plans for the future, sustainable development of the facility. · to liaise with BVSC on various aspects of the planning, use and development of the Twyford Hall Complex to ensure that all activities of the association are consistent with BVSC's role as Trustee of the premises. A report is to be presented to the Council meeting of 22 January 2014 to consider changes to Council’s process in approving donations to community groups and organisations. Twyford Hall is a Bega Valley Shire Council asset, managed by the Twyford Hall Committee (Inc). The Committee is responsible for all development, maintenance, cleaning and security of the building. The Committee has submitted a Development Application for the construction of an Entertainment Establishment subject to specific conditions of consent. The Group has been working with Council’s heritage advisor and a new design which satisfies the heritage issues and meets the conditions of consent has been completed. Archaeological investigations for Aboriginal Heritage are necessary prior to issuing of a construction certificate. Twyford Hall is located in the Central Business District of Merimbula and is used by the community for a wide range of activities including functions, art exhibitions, and retail promotions and by Spectrum Theatre for regular plays and musicals. The facility provide a social and cultural meeting place for the Merimbula and wider community. The facility will provide an opportunity to further grow creative industries in the area. Council does not provide funding support for Twyford Hall. The facility is a community asset run by the Twyford Hall Committee is otherwise a self-sufficient operation. Income for the 2012/13 year was $102,000 with expenditure of $36,000. Accumulated funds as at June 2013 are $156,000. Completion of both stages of the archaeological investigations is anticipated to be in excess of $30,000. Stage 1 of the investigations has commenced – estimated cost $14,000 (inc GST). 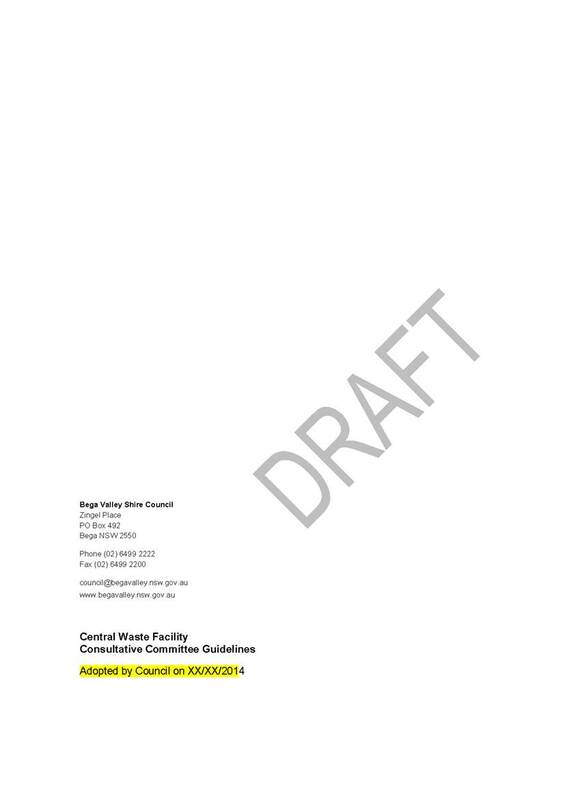 A copy of the request for donation application has been tabled for the information of Councillors and Twyford Hall forward planning issues paper has been separately circulated to Councillors. Council has a budget of $230,200 for donations, including donations approved by Council (ie contributions to events, promotions and projects), donations approved by the General Manager (less than $2,000 ie refund of fees) in kind assistance and civic functions. $164,650 has been expended in 2013/14, leaving $65,500 available. That Council consider the level of financial support for Twyford Hall Inc towards Archaeological Investigations required under DA 2007.0144. Four Winds Concerts Inc have submitted three requests for financial assistance for consideration by Council. Four Winds Concerts Inc have requested three items of financial assistance. Councillors have had several recent presentations from the Four Winds Concerts Inc and recently dealt with a number of planning matters related to the site. Four Winds building project “Nature’s Concert Hall is currently nearing completion, costing $3.1m (+ $1m pro bono) the facility will provide a year round calendar of events, building on its Easter Festival, providing economic stimulus to the region through tourism and the development of creative industries. The total cost of the Nature’s Concert Hall to date is approximately $4.1m. The Federal Government has contributed $1.67m through the Regional Development Australia Fund. The State government has provided $350,000. $1.07m has been raised through private donations and in the order of $1m has been donated through pro bono contributions. The group have also an ambition of being debt free at the completion of construction. Council has provided no direct financial assistance to the project however there has been considerable in kind support to the Four Winds Concerts over a number of years. The total request for the three items is $36,798.20. In discussions with Four Winds Concert Inc they would be willing to receive funding reimbursement over two financial years. The full applications are tabled for the information of Councillors. The request for assistance with funding the sealing of the access road results from a DA condition ensuring appropriate access and environmental protection on site. The facility is not a Council owned facility however is is a community facility which will now provide year round access for a range of community and cultural activities. The facility is a wonderful community and cultural addition. Festivals, cultural events, community and cultural development activities will be able to access the site and provide programs to build community social capital. Council does not provide funding support for Four Winds Concert Inc. The facility is a community asset run by the organisation is otherwise a self-sufficient operation. Council has a budget of $230,200.00 for donations, including donations approved by Council (ie contributions to events, promotions and projects), donations approved by the General Manager (less than $2,000 ie refund of fees) in kind assistance and civic functions. $164,650 has been expended in 2013/14, leaving $65,500 available for allocation this financial year. That Council determine the level of financial support for Four Winds Concert Inc in response to their requests for donation and refund of contributions and fees. A request has been received from the Sapphire Coast Turf Club for Bega Valley Shire Council to consider sponsoring a race on Bega Cup Day. Sapphire Coast Turf Club will host the annual Bega Cup Day on 2 February 2014 and is seeking sponsorship for the event. 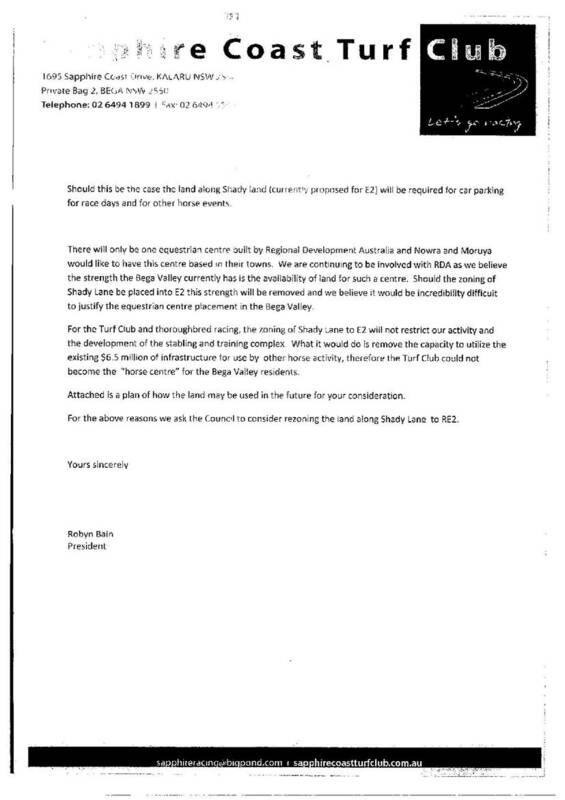 Bega Valley Shire Council has been invited to sponsor a race, which will entitle Council to naming right for one race. Sponsorship rate is $2,000 (excluding GST). Council has not previously supported requests for naming rights. Sponsorship of prize money for events is not available under Council’s requests for financial assistance procedure. This request is however for sponsorship for the race. • Promotion of your logo on our website www.sapphirecoastturfclub.com.au. A number of the benefits of sponsorship as outlined above would invoke the “Gifts and Benefits” sections and requirements of the adopted Code of Conduct and would need to be accordingly reported. The event is an important social and corporate day in the local region, and includes three feature races, the Bega Cheese Bega Cup, Bega Town Plate and Sapphire Coast Cup. Generally major race events as with festivals and other major events including sporting events contribute to the local economy particularly when large visitor numbers attend. Council has a budget of $230,200.00 for donations, including donations approved by Council (ie contributions to events, promotions and projects), donations approved by the General Manager (less than $2,000 ie refund of fees) in kind assistance and civic functions. $164,650 has been expended in 2013/14, leaving $65,500 available. Council has not supported the sponsorship/naming rights for a race at this event for many years. Council will need to determine if it wishes to take up the offer and if so how it will deal with the sponsorship package. That Council consider the level of support, if any, for the Sapphire Coast Turf Club Bega Cup Race Meeting. It is proposed to commence live audio streaming of Council meetings as part of Council’s Communications Strategy. 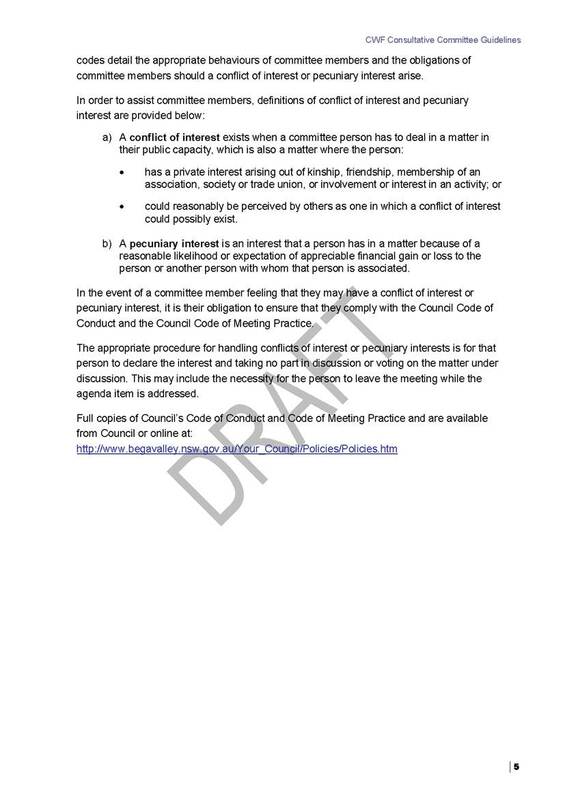 This will also trigger a review of Council’s Code of Meeting Practice. Council is committed to working to continually improve how it provides information about its decision making to the community. Over the past year a number of very positive ideas have been presented to the Council on how this could be done and a number of these have already resulted in some new initiatives and changes. Live audio streaming is one such area which has taken some more time to assess prior to implementation. As part of the continual improvement of Council’s engagement with the community it is proposed to commence live audio streaming of Ordinary and Extraordinary Council meetings. This will allow people to listen to the business of Council online when and where it is best for them. This could be at home on a desk top computer, on a lap top or mobile device, in a library or community centre with public access computers. Copies of recording of the meetings will continue to be kept and will be available to the public or for legal purposes as requested. The cost for provision of full copies or excerpts of meeting recordings is as detailed in Council’s Fees and Charges under GIPA guidelines. Since the raising of this as a potential opportunity to improve access to Council processes staff have been investigating the most effective models for undertaking this work and researching how other Councils have implemented such processes. There have also been suggestions of posting online filming of Council meetings but at this time this option has not been able to be fully scoped and funded. Technology to allow for the live audio streaming, and the costs for this, are able to be undertaken within existing resources and budget. A key area that has required some clarification is the need to ensure that the live streaming module is deactivated at the time Council resolves to enter into a closed confidential session and how to then ensure resumption of the live streaming at the appropriate time. A recording light will now be installed and the Code of Meeting practice is proposed to be amended to ensure compliance with all protocols. The Code of Meeting Practice will need to be revised to include Guidelines for the practice of live streaming recording. Particularly in relation to the cessation of recording when Council resolves and moves into closed, confidential session. As well as including information regarding Live Streaming of Council meetings, staff have taken the opportunity to review the Code of Meeting Practice and some minor amendments are proposed. These changes include expanded reference to the provision by Councillors of declarations of interests, options and guidelines for the provision and tabling of petitions to Councils, including a process for the provision of online petitions, and minor typographical, grammatical and process amendments in line with the Division of Local Government guidelines. A copy of the amended Code of Meeting Practice showing tracked changes is attached, for Councillors approval. It is proposed to exhibit the approved Code of Meeting Practice for a period of 28 days, to allow public comment. It is appropriate that Council consider options to allow improved access for members of the community to Council meetings. Live audio streaming is a cost effective and accessible method to achieve this and the Code of Meeting Practice has been revised to allow these changes. 1. That Council formally resolve to implement live audio streaming of Council meeting. 2. That the revised Code of Meeting Practice be placed on public exhibition for a period of 28 days. 3. That the revised Code of Meeting Practice be adopted, or if feedback is received, a further report be presented to Council. 4. That following adoption of the revised Code of Meeting Practice live audio streaming of Council meetings commence as soon as possible. The Local Government NSW Tourism Conference 2014 will be held in the Hunter Valley on 10 – 12 March 2014. The Local Government NSW Tourism Conference 2014 will be held in the Hunter Valley on 10 – 12 March 2014. The theme of the conference is “Harvesting the Value of Tourism”. SCT Ltd, Council staff and other local agencies are currently planning a local tourism/business growth conference to be hosted locally in 2014. The local conference will be aimed at presenting major national and state bodies and local operators and networks such as Cruise Eden, Australia’s Coastal Wilderness, Canberra Airport, the recently supported Australia’s Oyster Coast and Destination NSW and Tourism Australia the opportunity to present their vision for the south east and conference streams will focus on developing new partnerships and opportunities locally. The scoping for the conference is being undertaken by SCT Ltd and will be presented to Council in the near future. Attendance at the Local Government NSW Tourism Conference will provide an opportunity for Bega Valley to promote the local conference and gain ideas about how to gain the best advantage from a major business growth conference run locally. The conference is an excellent opportunity for local government bodies to share experiences, network and gain a broader understanding of local government tourism models and opportunities. Destination Management Plans - one year on, an insight into the success of the plans and the challenges as seen by DNSW, private consultants and a local Broken Hill perspective. The Lifecycle of an Event - explore where three very successful events currently sit – have they out run their infrastructure, can they still develop – if so where, how, what can be leveraged, how to disperse the offering, is it time to close down and start again? Or Reinvent? Harvesting the Value of Tourism - Return on Investment will be a joint presentation on the value of local government tourism with statistics from Tourism Research Australia and a number of ways of using this re models of economic development. If you are forever protesting the true value of tourism to your community and constituents, this is for you! Short Term and Holiday Rentals - join the LGNSW’s Senior Policy Officer for Planning and explore the real case study of Gosford City Council and its implications for other destinations. Site inspection 1. Kurri Kurri Town of Murals - a bus tour of a selection of the 54 outdoor murals within Kurri Kurri and surrounds set up by Towns with Heart to bring new life to the area. A great example of volunteering and community driven product development and ownership of tourism. Site inspection 2. Creating Opportunities beyond the Obvious - travel back to 1830 and to Wollombi and understand how heritage can be part of the tourism experience in different ways. Come and experience The Convict Trail Project – commemorating the Great North Road. Site inspection 3. Hunter Valley Delights – diversification of product mix to enhance the destination. This trip will indulge you with an exclusive sparkling winery tour, and tastings at both the Hunter Valley Olive Centre and Chocolate Company – The Barn. Learn how these operators have enhanced the value of tourism to the destination by changing the product mix. Tourism is a major local industry and is supported by Council through their funding of SCT Ltd. Whilst Council is not directly involved in tourism marketing and promotions the input into the local economy from tourism has wide implications for local government. It is critical that Council support all local business growth opportunities and takes advantage of the opportunities to grow expertise in this and other relevant areas. The 2013/14 Budget provides for $32,570 for delegates expenses and the professional development of Councillors. This budget area includes any costs for Councillors attendance at meetings as delegates to committees. Approximately $12,000 has been expended from delegates expenses and a further $8,000 (dependant on the number of Councillors attending) will be required to attend the ALGA National General Assembly. 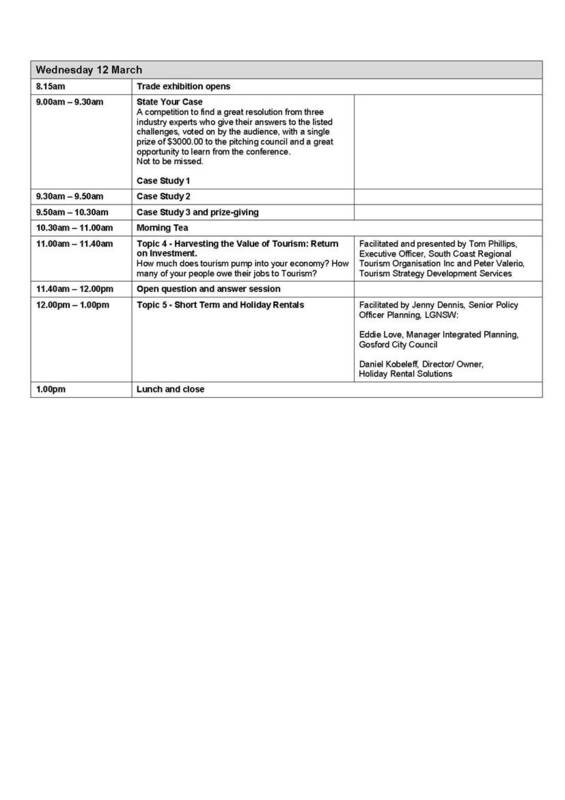 Councillors resolved to hold two day workshop in February 2014 at an approximate cost of $11,000 including room hire and accommodation costs. Early bird registration (by 27 January 2013) is $583.00. It is anticipated travel and accommodation costs will be approximately $700 per attendee. The Local Government NSW Tourism Conference is an excellent opportunity for local government staff and councillors involved in tourism operations to look at tourism operations across the state. Attendance at the Tuesday and Wednesday session would be of the most benefit to representative from Bega Valley Shire Council. 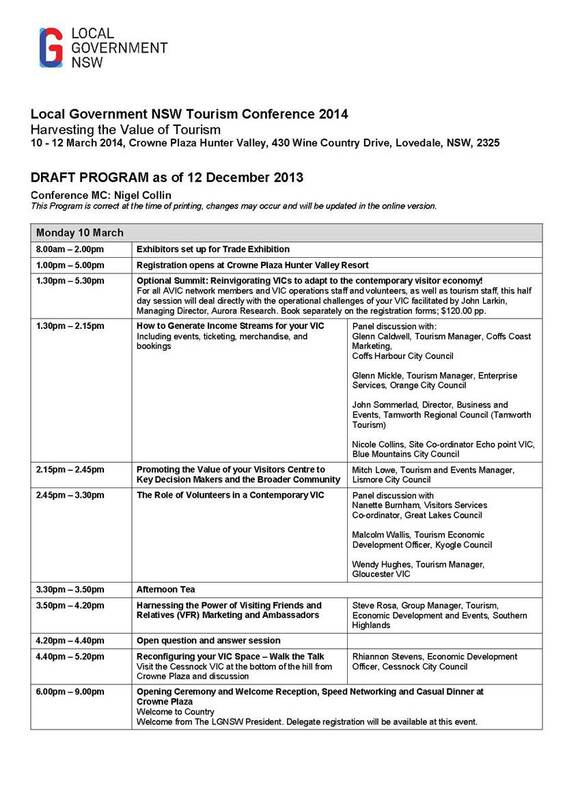 That Cr (name to be inserted) attend 2014 Local Government NSW Tourism Conference on Tuesday 11 and Wednesday 12 March 2014 and that the necessary expenses be defrayed by the Council in keeping with its policy. Following resolution by Council, a Request for Quote to engage a company with expertise in communications, to assist in the development of broader engagement and community input opportunities was advertised. Throughout 2013, a Communications Strategy was prepared, exhibited and reported to Council. Preparing the strategy allowed us to focus on what we want our communications to achieve, and how this is best accomplished. Extensive research revealed that our past efforts were lacking in terms of providing clear and succinct information to the community, which results in confusion, misunderstanding and missed opportunities in terms of community engagement and feedback. This strategy addresses our gaps in communications by identifying our weaknesses and providing in depth research on the needs of information consumers. Through this, a list of actions has been identified that see community needs leading to the fulfilment of organisational aspirations. That the General Manager work with staff to engage a company with expertise in communications to prepare a strategy for broader engagement and a detailed action plan for community input opportunities. The above resolution linked the Communications Strategy and Council’s adopted Community Engagement Policy and Procedure which was due for review as part of Council’s policy and procedure review across all areas. A review of potential funding sources for undertaking this review needed to be identified as this was a non-budgeted item. Following identification of some salary savings due to the non-backfilling of vacant staff positions during the General Manager appointment and some revoting of unspent funds in the community planning area in 2012/13 a budget amount was identified. A Request for Quote (RFQ) was then developed and provided to three consultants who have a high standing within the communications field. This model under Council’s procurement procedure was utilised as it allowed for a shorter timeframe to appoint an appropriate consultant. 1. Review of our current activities and future priorities. Following review and feedback of the above, a detailed implementation plan including advice on timing, resources and implementation strategies for an 18 month period including review points. To enable effective delivery and consistency throughout the organisation, identify staff training opportunities across the organisation and delivery of staff training and engagement covering our processes and implementation plans to enable workplace ownership of communications and community engagement. The RFQ process closed on the 11th December 2013. Possibly due to time restraints from the identified consultants, only one written quotation was received. The International Association for Public Participation lodged a response however it was aimed mainly at the training and skill development and did not meet the criteria in relation to assessment and review of the Council’s documents and processes. Staff are of the opinion that in order to ensure the best outcome for the community and the Council that a broad expression of interest needs to be undertaken and the budget possibly increased to cover all aspects of this review. The NSW Local Government Act 1993 is currently the focus of an extensive review. The final draft report from the Local Government Acts Taskforce is currently out for comment. It embeds in it the Integrated Planning and Reporting Framework and at Topic 3.2.2 Community Engagement the report recommends a number of actions to be embedded in the Act. g. consider all groups, even though it may be difficult to reach every diverse community group, and some groups will choose not to engage. Council will be guided by the final gazetted Act and will appropriately review its processes at that time. The current review of the Environmental Planning and Assessment Act 1979 which has resulted in the proposed Planning Bill and Planning Administration Bill includes a framework for community engagement within the NSW Planning System. These Bills have yet to pass through Parliament and when gazetted will also initiate a review of Council’s policy and procedures to ensure compliance. Improving our consistency in communications and engagement will enable Council and community to further develop a positive and trusting relationship. In addition to the development of the Communications Strategy in 2013, an additional review was made available through a partnership with the University of Wollongong to address gaps identified in the community survey relating to Council’s two way communication with the community. § Implement a Suggestion Box concept in public areas such as the front counter or libraries with a form for follow up. § Improve Council’s media presence. § Community and Councillor ‘roving’ workshops to enable better opportunities for the community to meet with Council. § A review of Council’s website and technology options are under review. Council is making considerable efforts and advances in the improvements of communications and engagement, and it is anticipated that the advice and training opportunities provided by an external consultant would enhance this and assist in the development of positive community relations. It is clear the community expect Council to undertake further work in this area and staff believe that the approach needs to be broadened to gain the best outcome. Funding of consultants costs will be allocated through salary savings and unexpended funds from the community planning area from 2012/13. At this time an amount of $15,000 has been identified however if a full EOI process is put in place it is expected that additional funding will be required. Staff time of Community Engagement and Planning Co-ordinator, and Communications Coordinator. Training opportunities to involve key staff within the organisation will be identified when the successful company is appointed. In order to broaden the scope of this project it is also timely to consider establishment of a community reference group for this and ongoing communication and engagement processes. Establishment of a reference group with representation from communities across the Shire would provide Council with an excellent point of contact for ensuring relevance of communication and engagement methodologies and would tap the considerable expertise of local people who have already provided considered advice and input into Council processes. A recommendation to this report includes the option for Council to request staff to develop the terms of reference and membership criteria for such a reference group to be reported back to Council. If Council is of a mind to establish this group it is expected that the report outlining the terms of reference and recommending calling for nominations would be presented to the Council meeting in February. Seeking of consultancy services to provide a formal review of Council documents, processes and approach as well as advice and training would be of benefit to the organisation and community. The timing of the request for quote, close to the end of the calendar year restricted the number of consultants providing quotes. It is anticipated that a greater response would be had by re-advertising the request. 1. That Council advertise a Request for Quote to engage a company with expertise in communications and community engagement to provide a review of Council communications and engagement strategies, procedures, and proposed action plan and to provide advice on implementation of a staff training plan. 2. 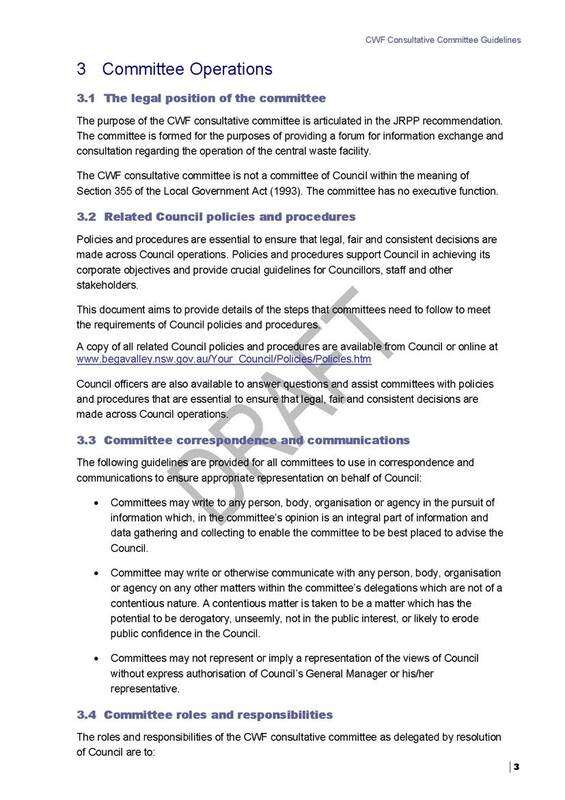 That Council request staff develop guidelines for the establishment of a reference committee to assist and advise Council on community engagement and communication and that the guidelines and framework for the committee be reported to the next Council meeting. To report the details of Council’s investments during the month of December 2013. 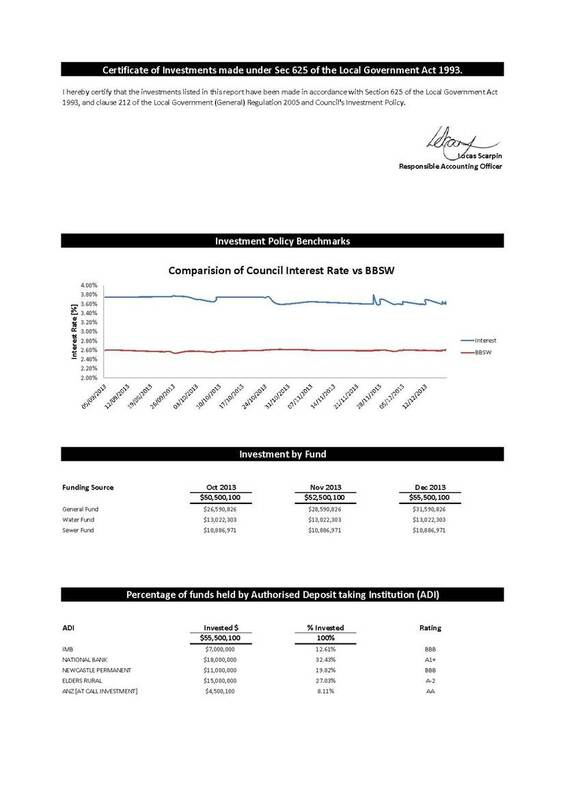 Council holds an Investment Policy published under policy number 1.3.2. This policy is reviewed annually, and was reconsidered on 4 September 2012. 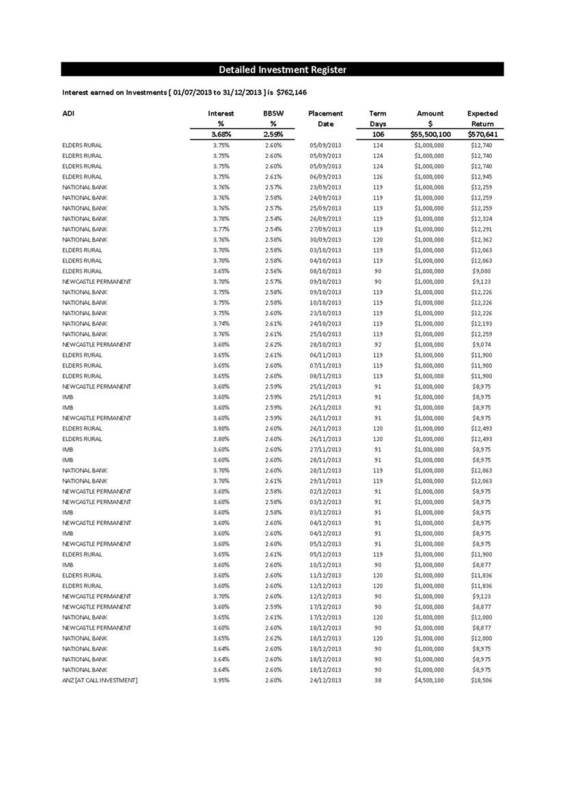 The attached report indicates a current investment portfolio of $55,500,100. In addition there is $758,235.83 in uninvested funds in Councils operating account. The restrictions reported in Table 2 relate to 30th of June 2013. Council formally calculates its restrictions as at 30th of June each year. These restrictions are not reset until the following year Financial Audit. Any movement of funds during the year, is therefore, shown as movement in unrestricted cash. There have been expenditures between 1st of July – 30th of November that will result in reduced restrictions (for example transfers from reserves to fund capital works), but is not reflected in the above table. Council has identified building local business as a major focus for the future. This is a high priority with many positive opportunities about to be realised such as the Eden Port development, the South East Regional Hospital, growing university programs locally, the Renew the Valley project and food, marine, renewable energy and ITC business opportunities. These opportunities as well as tourism, retail and the Merimbula airport need to be supported and promoted. It is timely to focus the Council’s activity to ensure that it facilitates business opportunities and promotes the area as a viable, dynamic regional area. It is crucial that local businesses and the broader community are involved in this process. 1. 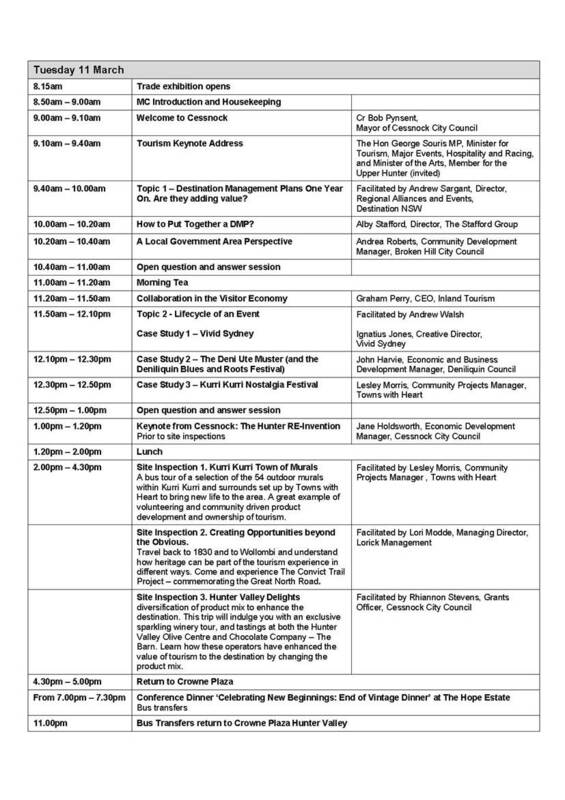 That the Bega Valley Shire Business Forum, Chambers of Commerce, senior staff and Councillors, and any other interested body be invited to put forward suggestions to promote and grow new small business locally for consideration by Council. These ideas to be considered and researched for inclusion in the Council’s draft business growth action plan to be presented to Council. 2. That Council consider the establishment of a section 355 committee with broad representation to be an advisory body on sustainable business growth options in the Shire and that the first meeting of this group be a broad forum focussing on discussing the draft business growth plan prior to presentation to Council.